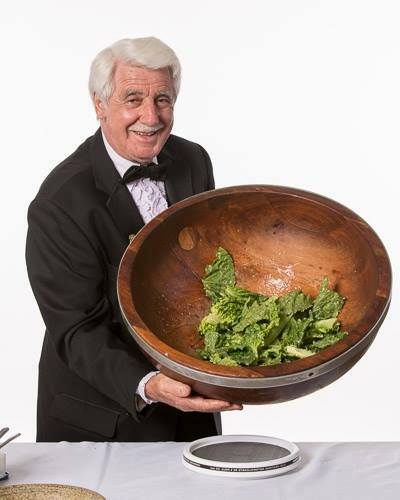 Don't miss Alfio creating his award-winning Caesar Salad. It's the BEST Caesar Salad you will ever have! The ruffles on Alfio Gaglianese's pink shirt fan gracefully over the lapels of his dark tuxedo jacket. Pink cuffs peek out - just the proper length - from the sleeves. He could be a flamenco dancer, but he is instead talking about his custom-made Caesar salad bowl and how it has a life span of about 25,000 salads. Gaglianese, 63, who owns and operates Alfio's Restaurant in Glenside, has turned his Caesar salad-making into a very personal art form. These are not simply Caesar salads he makes. They are table-side Caesar salads. And he promises to give us easy-to-follow instructions to make this classic. These days he's incorporated a bit of magic into an already theatrical presentation that includes flipping a peppermill end-over-end and catching it with the same hand as easily as most people look at a wrist watch. ``See this napkin?'' Gaglianese is showing a maroon linen napkin to a pair of diners for whom he's making Caesar salad. He holds it up by the corners and offers a view of the front and back. It is just a plain napkin. Nothing tricky here. He snaps the napkin with a flourish, and then, with just a bit of it showing through his fist, he gives a gentle squeeze. To the wide-eyed amazement of the diners, a stream of lemon juice rains magically into the salad bowl. Not something that you want to attempt at home. Gaglianese has been making Caesar salad since he came to this country from Calabria, via Argentina, in 1966. He's now halfway through his sixth salad bowl, so in salad years, that would mean he came here about 150,000 Caesar salads ago. DaVinci Restaurant, a long-ago city landmark near 20th and Walnut Streets, gave Gaglianese his first job as a waiter in this country. He had waited on tables a short while in Argentina, after deciding that apprenticing as a bricklayer was not for him. He admits to trying innovations, but remains loyal to his original. ``It's the best,'' he says. ``I tried using balsamic vinegar once, not for customers, but just for myself, as a test, but it didn't work. It didn't taste right and it stained the bowl. Gaglianese says the egg is important to the salad. It is what holds the ingredients together and gives the dressing its best texture. The Caesar salad, according to published accounts, was created in Tijuana, Mexico, nearly 60 years ago at the downtown Caesar Hotel and restaurant, which had been built and was operated by the Italian Caesar Cardini. He developed a dressing that became a favorite of his customers. As business boomed, he was joined by his brother Alex, a World War I Italian air force ace. In a tribute to the pilots at a San Diego, Calif., air base, Alex took his brother's salad dressing, modified it with other ingredients and called it Aviator's Salad. Soon, the story goes, the popular, often-copied dish became internationally known simply as Caesar Salad. Traditionally, the salad was prepared from scratch at the customer's table. That formality, however, was phased out at the restaurant, except on demand. Also, as time went on, the dressing was made in large quantities. The original recipe called for anchovies, but eventually they were left out because they were too salty. It seems possible that Gaglianese's recipe is closer to the original than what the salad became. ``Use four romaine leaves per person. Healthy, good-sized ones. Wash and shake them dry. Put them on a plate and cover them with a damp linen napkin. Put them in the refrigerator for a couple of hours. This will keep them fresh and crispy. ``Now you make the dressing first,'' he says, giving the 25-pound salad bowl a twirl and watching it spin in place atop the salad cart. ``See, it spins but doesn't move,'' Gaglianese points out proudly. ``I used to use a lighter bowl, but if I would spin it, it would walk all over the tables. Gaglianese uses a metal fork and spoon for this, holding the spoon on top of the fork in his right hand, and crushing the garlic against the bowl, working in a circular motion. ``Now you add four anchovy fillets and continue to mash them into a paste with the fork and spoon. Then, if you are using it, add the egg. Like I said, this holds the dressing together better. Now a half-teaspoon dry mustard and the juice of half a lemon. Keep moving and blending everything together. I notice that at this point the fork is on top of the spoon, which is working against the bowl. The master lifts up the bowl and twirls it a bit, causing the dressing to spread out in a thin layer. Watching the 154-pound Gaglianese toss around a 25-pound salad bowl was almost as interesting as the salad-making. Equally as interesting, Gaglianese told me he eats a couple of gallons of ice cream a week, along with cake, and has gained only six pounds in 30 years.